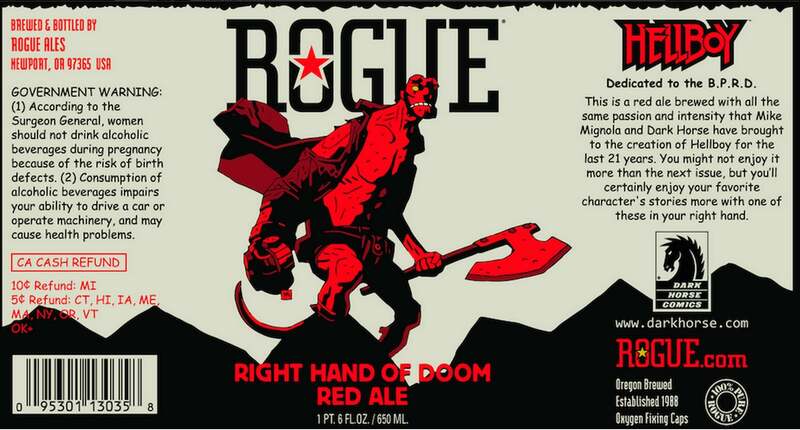 Oregon-based brewery Rogue Ales and Dark Horse Comics have recently announced a collaboration to create a limited-edition beer toasting the 21st anniversary of the creation of Hellboy. The character, created by Mike Mignola, is one of comics' most beloved and iconic creator-owned characters. Hellboy has been featured in numerous graphic novels and comic books as well as several movies (animated and live-action). This milestone anniversary did not go unnoticed by Dark Horse - and seemed fitting to Mignola after Rogue Ales suggested the idea. Named after Hellboy’s infamous right hand, Right Hand of Doom is a red ale that comes in at an assertive 6.8% ABV, as well as bitter notes from Bravo, Perle & Cascade Hops. The end result is a beer with just the right amount of bitterness to compliment a lifetime of demon hunting. Officially dedicated to the B.P.R.D., Right Hand of Doom will be released in 650 ml bottles featuring a drawing of Hellboy by Mignola on their labels. Right Hand of Doom will debut at an event at the Things From Another World Comics in Portland on Friday, February 20th. There, Mignola, Matt Kindt (Mind MGMT), Eric Powell (The Goon) and Brian Wood (DMZ) will be on hand for signings beginning at 4 p.m., with Mignola's signing beginning at 6 p.m. If you’re further away, you can pre-order the beer to be delivered to you (with some restrictions for certain states) from Rogue Ales here.